Vanilla cake icing is the most common and most popular flavor in America, and for good reason: it pairs beautifully with almost any cake variety, mixes well with other frosting types, and is incredibly versatile in terms of both decoration and flavor. Depending on how you make it, vanilla icing can be thick or thin, have a silky or grainy consistency, and feature any color of the rainbow. It is most often made with a buttercream recipe, but vanilla flavor can also be added to a meringue, a fondant, or any other type of frosting. 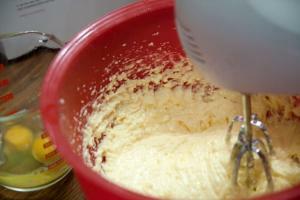 Cream butter or shortening in a mixing bowl until it's fluffy and light in texture and color. Gradually add confectioners' sugar or granulated sugar until it's incorporated and the mixture is fluffy again. You may also add a small amount of milk, water, lemon juice, or salt. Beat in vanilla extract, vanilla-bean paste or the scraped inside of a vanilla bean to flavor the icing. Icing with a very thin consistency works well for spreading on cookies or on top of cakes, since it won't matter if it drips over the side. A medium or thick consistency is best for spreading all over cakes and cupcakes and using as filling between cake layers, and medium to stiff icing is ideal for piping details with a pastry bag and frosting tip. Vanilla cake icing is basically a flavored sugar paste, which makes it useful in nearly any dessert. It's a classic for cakes and cupcakes, but although those might be its most common vehicles, they're far from the only possibilities. 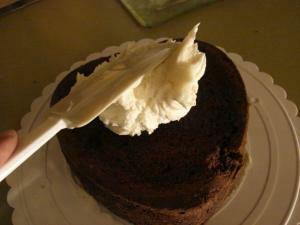 Use a butter knife or flat spatula to spread icing on top of a cake or cupcake. To add flavor and secure multi-layer cakes together, spread frosting between each layer as you stack a cake. Scoop out the centers of cupcakes and fill them with vanilla icing. Top a batch of cookies with small dollops of frosting. Serve "frosting shots" at parties - shot glasses filled with spoonfuls of frosting to act as sugary pick-me-ups. Have a spoonful of frosting with fresh berries or fruit as dessert rather than ice cream or whipped cream. Garnish a crepe, pancake, waffle, or other baked good with a tiny scoop of frosting. Spread frosting on top of cooled cinnamon buns, muffins, or coffee cake to add sweetness. Unless you're using a new, unopened bag of powdered sugar, sift the sugar before adding it to the frosting mixture. Use gel food coloring to tint frosting; liquid food coloring could throw off the consistency. Start out with just a few drops, and add more if necessary to get vibrant, vivid color. Always refrigerate vanilla frosting if it contains butter, milk, or other ingredients that could pose a health risk after long periods at room temperature. Try flavoring frosting with the scraped insides of a vanilla bean pod rather than vanilla extract; the flavor will be far richer, and you'll be able to see the vanilla specks throughout. 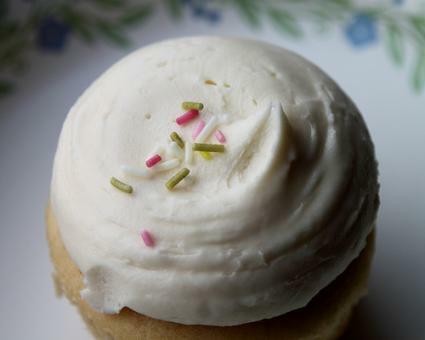 Vanilla icing is versatile, so modify your favorite recipe with other flavor additions, like almond or butter flavorings, to create a unique taste. This will take your vanilla icing to new levels of flavor.